I believe this is Ransom Rigg's first novel and I suspect it will not be his last. He is a fellow blogger, a film-maker, a travel writer and an essayist and while he doesn't have the finely tuned hand of an assured novelist, he comes close in his debut. According to Riggs there will be a sequel to Miss Peregrine. (Which I suspected from the ending.) Also I read online that Tim Burton might be looking to make the film - no surprise there - it's a project that's right up his particular alley. MISS PEREGRINE'S SCHOOL FOR PECULIAR CHILDREN is a book based on a batch of odd, assorted vintage photographs. From the cover photo alone, you suspect immediately that you're in for something unusual and you'd be right. "All the pictures in this book are authentic, vintage found photographs, and with the exception of a few that have undergone minimal postprocessing, they are unaltered. They were lent from the personal archives of ten collectors, people who have spent years and countless hours hunting through giant bins of unsorted snapshots at flea markets and antique malls and yard sales to find a transcendent few, rescuing images of historical significance and arresting beauty from obscurity..."
To say that most of the photos featured in the book are odd is an understatement. The creepiness quotient you'll have to figure out for yourself. But I did wonder over and over what on earth was really going on in these photos. What the photographer was trying to say. What circumstances led up to a particular photo. Who were these people? Ransom Rigg's explanation is as good as any. Jacob Portman is a stressed out Florida teenager with a head full of fanciful stories of a mysterious island in Wales where his grandfather spent his childhood. The stories are those which Jacob's grandfather had always told him and which Jacob, when very young, had always believed. In Poland, just before the onslaught of WWII, Grandpa Portman's parents had shipped him off to a safer place while they stayed behind and perished in the Holocaust. The stories his grandfather told Jacob were sketchy, full of the weird doings of children left behind at the orphanage on the island. The stories were not without threat from some mysterious monsters and as Jacob grows older, he tries to understand them as allegories of the dreadful loss his grandfather had experienced at the hands of the Nazis. But after awhile not even that can explain his grandfather's irrational behavior. Apparently, he has become just another delusional old man. But when a horrible event occurs, changing Jacob's life forever, the result is a boy plagued by insistent nightmares and irrational fears. His hapless parents, fearing for his sanity, bring in a psychiatrist to tend to their troubled son and continue Jacob's schooling at home to reduce the stress factor. When it appears as if only a visit to Wales and the mysterious island where his grandfather once lived can cure Jacob of his imaginary fears, he and his father set off. What Jacob finds is a bombed out wreck of an old mansion, a cache of ancient photographs, some very peculiar children (whom logic says should not be there at all) and the impossible truth of what his grandfather had always tried to tell him. 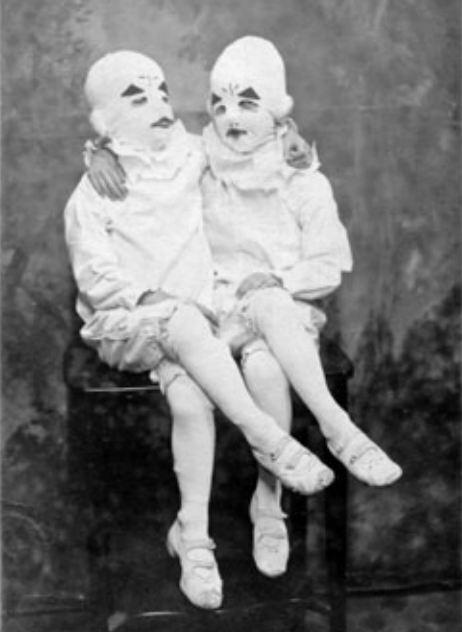 The quirky photos included in the book upstage the story concocted around them, they are creepier than any invented author explanation. But this is still the sort of colorfully told story that will make you think twice about all those old photos you might have stashed in the attic or basement. I know I'm going to take a closer look next time I'm at a flea market. Book designed by Doogie Horner. Link to author Ransom Rigg's blog. This looks very interesting. WIll have to explore this further! Thank you for sharing. I liked the idea of building a novel around those found photos. And many of them are extremely strange. Some of them are practically nightmare inducing. But I don't think Riggs is a novelist at all. The book in nothing but incident. There is no real conflict and the ending is ambiguous. For this reason I think it was shifted to a younger audience. It's not at all an adult book, IMO. I was caught up in some of the bizarreness and the quirky characters, but really there is not much at stake. When it was all over I just shrugged and said, "That's it?" You're welcome, Lucy. It is an interesting read and an intriguing way to tell a story. John: Well, at stake is the continued existence of the kids, etc. But I think the fact of having to reveal so much information about the orphanage's inhabitants worked against the plotting. It's not great writing by any means. In fact, parts of it I found a bit boring, but I was still intrigued enough to continue reading. Yeah, some of those pix were downright scary. Hard to believe they're all real. I wonder what the next book will bring. I've wanted to read this book since it came out, but all the hype kinda turned me off of it. Now that I know you liked it, I may have to up my reading of it. As one who collects 19th century photographs, I can very well equate with this book. There are so many images in my collection for which I have woven imaginary lifetimes! Too eerie for me, the blog scaredy-cat. Saw those pictures and bolted across the yard and up the tree. Ryan, it's not a great book, but it's worth a look and it reads very quickly. I liked most of it. But as John says, the ending is a little flat. I'm assuming that's because there will be a sequel. Mark, take a look at the book, you might find the photos (at least) intriguing. Also it really is kind of interesting the way Rigg's has woven a story around some of the strangest photos you'll ever see. You really do have to wonder. It's a particularly well designed book, too. Kathy, you have to stop bolting up the backyard tree, it makes the neighbors wonder. Ha! I'm joining Frannie and Agnes, Bob Tarte's cats in Kitty Cornered, another fun, but poignant book. He sure loves those cats, maddening as they can be sometimes. My husband's late grandmother used to say there was nothing sadder to her than to see stacks of old photographs at a thrift store or flea market. It was for this reason that she asked her kids and grandkids to destroy her old photographs if no one in the family wanted them after she passed away. I have asked my parents to at least go through the boxes of old photographs they have (some of them handed down to them from older relatives) and jot down on the back the names of the people in the photos and how they're related to us, but after 70-plus years, the connections to some of those far-off faces have long been severed. That looks kinda haunting and scary. But then I am just a scaredy-cat! Kathy I'm so glad you've taken to Bob's books. He's on Facebook and you can follow his and Linda's adventures there too. He takes some really good photos. Deb, that is a great idea to jot down the names and dates while there are people around who can still remember. I have a box of old photos I think this will be my project for the summer. I look at old photos in a different way than your grandmother did. I look at them as living pieces of history. For a moment the people in those photos live again even if their names are forgotten. Still, I can understand her viewpoint too. There is a great deal of melancholy attached to old photos of people whose names you don't know. iluvcinema: It's more creepy than scary. Really. It's an interesting read.